Snoring and obstructive sleep apnea (OSA) are common sleep disorders related to sleep-disordered breathing (SDB), resulting from repetitive narrowing and collapsing of the upper airway. Sleep deprivation and sleep disorders are highly prevalent health issues that have a major impact on your well-being and overall quality of life. If left untreated, SDB may further lead to several adverse health problems such as increased risk for cardiovascular disease, hypertension, and stroke. The impact of sleep loss and sleep problems can range from moderate to even fatal. There are multiple treatments available to help get rid of sleep-related issues, but first sufferers need to be diagnosed with the root cause of the sleep loss or interrupted sleep. A dentist can be a part of your treatment team dedicated to improving your quality of life through better sleep. A new field of dentistry called Dental Sleep Medicine now caters to offer physicians an effective option to manage sleep-disordered breathing, including snoring and obstructive sleep apnea. This field represents an interactive blend of medicine and dentistry, as dentists bring their unique skills to act on the problems that physicians face while trying to create and maintain an unobstructed airway during sleep. Continuous positive airway pressure (CPAP) technique has been found to prevent upper airway collapse, normalize nighttime sleep and breathing, improve daytime hyper-drowsiness, and decrease associated medical problems. The CPAP machine keeps your airway open by providing forced air through flexible tubing. CPAP therapy requires you to wear a mask as you sleep, and can be obstructive at times, which is why dental offices like Plaza Dental Group focus on methods that avoid the need of a CPAP machine. An oral appliance (OA) is a device to be worn in the mouth only during sleep. It adjusts like a sports mouth guard or orthodontic retainer. A customized oral sleep appliance is an effective treatment that keeps the airway from collapsing by supporting the jaw in a forward position. OA’s have evolved in the treatment of sleep-disordered breathing as an increasingly popular choice to more established therapies, including continuous positive airway pressure. Obstructive sleep apnea surgery is usually indicated when t treatments such as CPAP, oral appliances, and other behavioral therapies are unsuccessful or unbearable. It can be safe and remedial if performed by a well-qualified dentist, after correctly identifying specific anatomic sites or positions that contribute to upper airway obstruction, which vary among patients. With regular follow-ups, dentists are well positioned to participate in the identification, prevention, and treatment of your sleep disorders. Visit your local dentist today! Obstructive Sleep Apnea, where the airway blockage is caused by the soft tissues of the back throat. Central Sleep Apnea, where the brain is less stimulated during sleep thus it fails to send signals to the muscles to breathe. Central Sleep Apnea is more common among Americans. Lack of brain stimuli during sleep can cause significant brain damage. Therefore, this condition requires immediate attention and calls for medical examinations. Sleep medicines are the traditional way to treat sleep disturbances but have their own side effects. Now dentistry has found new avenues in treating sleep loss and sleep-related breathing issues. The treatment approaches in sleep dentistry are proving extremely helpful and much better when compared to sleep medicines. Dentists are more familiar with the oral structure and are in a better position to identify sleep problems. They can even spot the snorers in the dentist’s chair. The treatments of sleep disorders through oral therapy are highly effective. This is the reason sleep disorder treatments are rapidly finding new a new home in the areas of dentistry. Dentistry is connected to sleep disorder treatments through oral appliance therapy which makes use of specially designed equipment to deal with the disturbed sleep. There are certain oral procedures too that can help in alleviating the sleep-related problems. However, not all dentists can perform sleep treatments and only the ones who are well-trained and enrolled on the panel can be able to perform the treatments. OAT (Oral Appliance Therapy): Co-treating sufferer with physician’s supervision as well as by using Oral Appliance Therapy (OAT) simultaneously. OAT is basically a device that patients need to wear as they sleep. It functions as a mouth guard and prevents the airway blockage during sleep. It keeps the jaw and tongue away from the throat in a forward position and prevents the throat from collapsing. Oral surgical procedure: The air blockage during sleep is treated by surgically bringing the tongue forward and away from the throat. CPAP (Continuous Positive Airway Pressure): is an airway pressure ventilator that continually supplies required air pressure to sufferers to keep them breathing on their own during sleep. 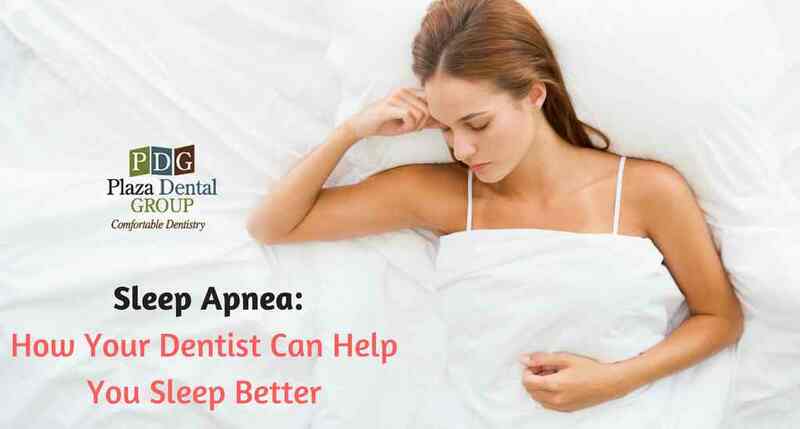 Patients suffering from sleep loss or chronic sleep-related breathing disorders are finding utmost relief with sleep dentistry treatments. If you have sleep problems or simply have a question related to sleep disorders and dentistry, get in touch with your local dentist today. What are the Common Reasons for Tooth Extraction?